When something is my fault, I’ll own up to it. I expect the same from others; however, this has been a source of disappointment. 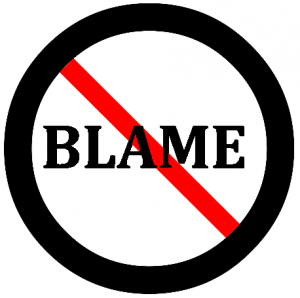 I don’t believe there’s much to gain in allowing someone off the hook by erroneously shifting blame to others, including yourself. I know it might seem like a good diplomatic move, to gain trust and all. But it’s lying. It’s as much lying as blaming someone else for your mistake. I hate the blanket statement, “we all have part of the blame”. If it’s not true, it only means that diplomacy is more important than a solution. So don’t look to me to accept your mistake, all or part, as my own. I’ll help try to fix it and even help guard your secret if needed; I’m all about teamwork, loyalties, and making things right without the drama. And I’ll take my lumps for my failures. If they’re known, of course.